kick·start (noun) 1. To start by means of a kick-starter; 2. To jump start. KickStarts are basic, no-frills coding samples, made so you can get started, fast. Each example takes no more than a few minutes to set up and try. They're available as individual downloads or together as a full zip archive. All KickStarts are accompanied by code examples. 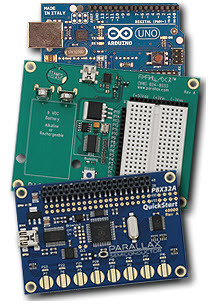 KickStarts provide working PBASIC, SPIN, and Arduino code and connection diagrams for the Parallax Propeller QuickStart, Propeller Board of Education, BASIC Stamp 2 HomeWork Board, and Arduino Uno. In most cases, the programming code will also work for variations of these microcontroller development boards, such as the BASIC Stamp Board of Education. Adapt the wiring connections as needed. Click on the Support -> References link at the top menu for all non-product KickStart articles. All code accompanying these KickStarts is copyrighted under the Creative Commons 3.0 SA license, and is free to use and modify. Articles authored by Gordon McComb for Parallax Inc.